Bangkok is known for historic sites, shopping, nightlife, spas, and nature. 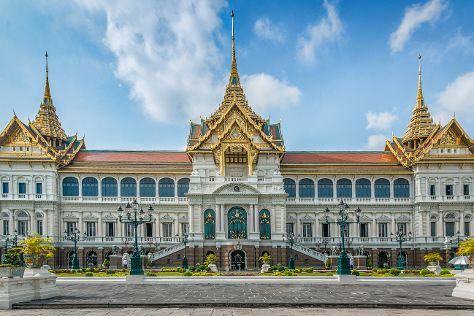 Your plan includes some of its best attractions: explore the historical opulence of The Grand Palace, don't miss a visit to Khao San Road, take in the spiritual surroundings of Temple of Dawn (Wat Arun), and shop like a local with Chatuchak Weekend Market. For ratings, other places to visit, maps, and other tourist information, read Bangkok day trip website . Expect a daytime high around 41°C in May, and nighttime lows around 32°C. Finish your sightseeing early on the 6th (Sun) to allow enough time to travel back home.